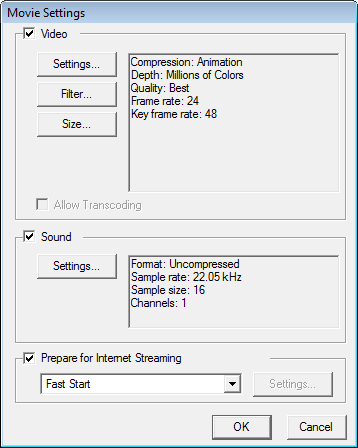 The Sound Settings dialog box lets you set the sound parameters when exporting a QuickTime movie. Some of the QuickTime movie settings will be overridden by the Storyboard Pro project or export settings. The Sound Settings dialog box is accessed through the Export to movie dialog box, then the Movie Settings dialog box.